Northrop Grumman Corp.’s NOC subsidiary, Northrop Grumman Systems Corp., recently secured a modification contract to procure an E-2D Advanced Hawkeye Aircraft for the Government of Japan. The majority of the work will be carried out in St. Augustine, FL and Syracuse, NY. Valued at $164.3 million, the contract was awarded by the Naval Air Systems Command, Patuxent River, MD. The deal is expected to be over by March 2020. The company will utilize foreign military sales funds to finance the task. As Japan looked to strengthen its Air Force arsenal, in 2014, the Japan Air Self Defense Force (JASDF) opted for the E-2D Advanced Hawkeye to fulfill the nation’s Airborne Early Warning and Control (AEW&C) requirements. This advanced weaponry was selected as it featured the powerful AN/APY-9 radar, designed to provide 360° coverage against hostile aircraft and cruise missiles. In November 2017, the first flight of Japan’s E-2D Advanced Hawkeye was successfully executed. This marked a significant milestone in terms of delivery of advanced airborne early warning and surveillance capabilities to Japan Air Self Defense Force (JASDF). Consequently, the procurement of the latest deal will strengthen Northrop’s commercial relationship with the country as well as strengthen Japan’s ability to meet evolving security and intelligence needs. Northrop Grumman’s Aerospace Systems (AS) unit, which develops and designs military aviation aircraft, manned aircraft, autonomous systems and spacecraft, witnesses a steady inflow of contracts from Pentagon and the foreign allies of the United States. As a result, this segment witnesses solid top-line growth. The company’s Aerospace Systems unit generated solid revenue growth of 11% during second-quarter of 2018 revenues, buoyed by higher volumes of manned aircraft programs. With the E-2D Hawkeye Aircraft being a significant defense program for the government of Japan, we can expect more such contract inflows in the near future. These contracts along with the latest deal should enable Aerospace Systems unit to post solid results in the upcoming quarters as well. Recently, the company acquired rocket and missile maker Orbital ATK for $9.2 billion. This strategic buyout will enable Northrop Grumman to enhance its product portfolio and capability in manufacturing technologically advanced combat platforms. It will also benefit from Orbital ATK’S knowledge and expertise in satellites, spacecraft components and commercial space-launch systems. Moreover, the acquisition will lead to strong combined cash flow generation that will allow Northrop Grumman to innovate more such notable weaponries for the United States. Furthermore, the fiscal 2019 defense budget that won the Senate’s nod this July, provisioned major war fighting investments of $21.7 billion for aircraft. Such inclusions indicate solid growth prospects for Northrop Grumman’s segment in terms of contract wins. This, in turn, is likely to boost the company’s profit margin. 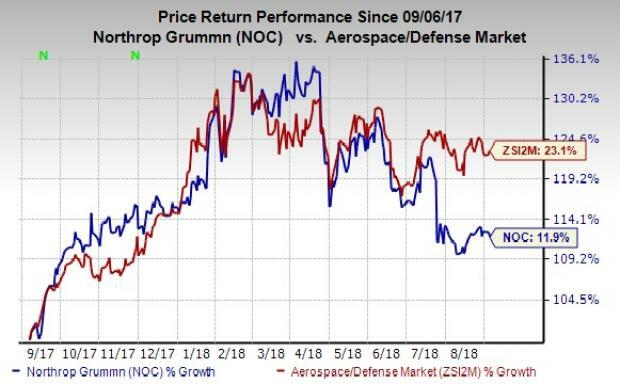 Shares of Northrop Grumman have rallied about 11.9% in the past year compared with the industry’s gain of 23.1%. The underperformance may have been caused by the intense competition that the company faces in both domestic and international markets. Northrop Grumman currently carries a Zacks Rank #3 (Hold). A few better-ranked stocks in the same sector are Aerojet Rocketdyne Holdings AJRD, Engility Holdings EGL and Huntington Ingalls Industries HII. Aerojet Rocketdyne came up with an average positive earnings surprise of 9.27% in the last four quarters. The Zacks Consensus Estimate for 2018 earnings has risen 30.9% to $1.27 in the past 90 days. Engility Holdings delivered an average positive earnings surprise of 19% in the last four quarters. The Zacks Consensus Estimate for 2018 earnings has risen 16.8% to $2.02 in the past 90 days. Huntington Ingalls Industries came up with an average positive earnings surprise of 9.48% in the last four quarters. The Zacks Consensus Estimate for 2018 earnings has risen 3.7% to $17.24 in the past 90 days.